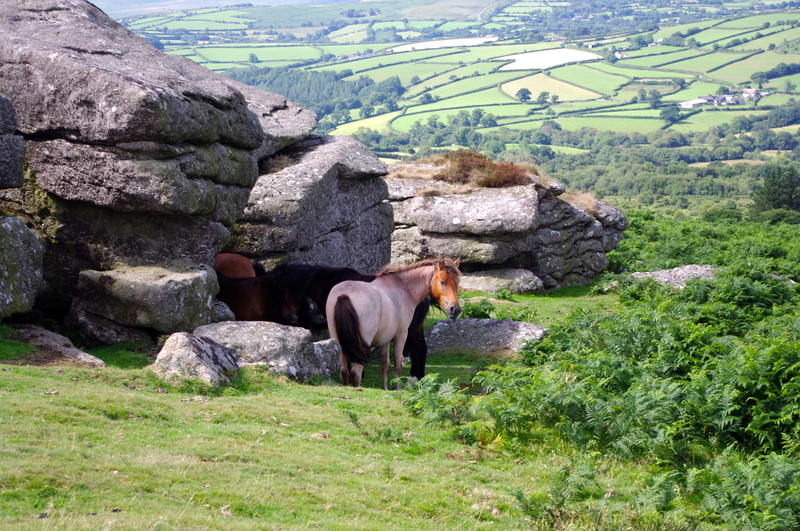 We have just returned from a short break exploring the bleak and beautiful scenery of Dartmoor as well as Devon’s stunning coastline. 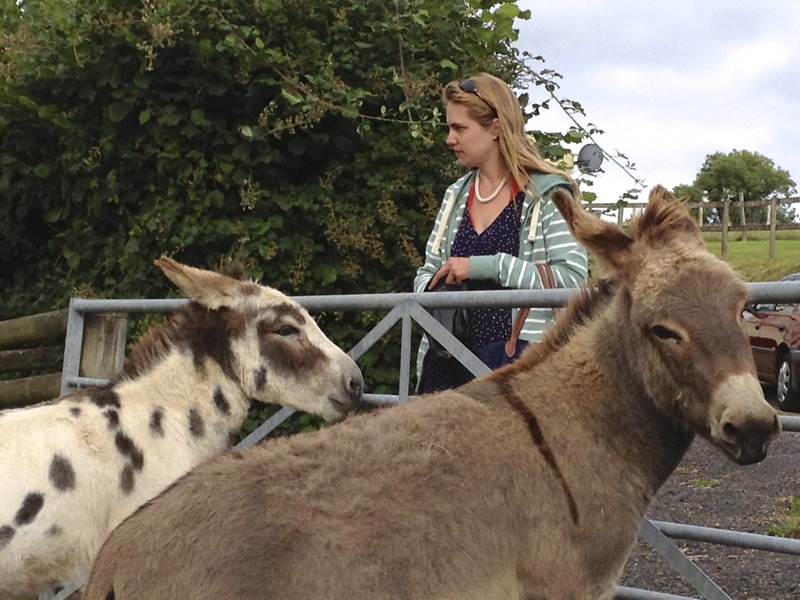 Parkers Farm (www.parkersfarmcottages.co.uk) is a family holiday park that I have been visiting with since I was a child. I have used it as a base in the winter months for white water kayaking trips with my husband and some of our more mentally unhinged friends. 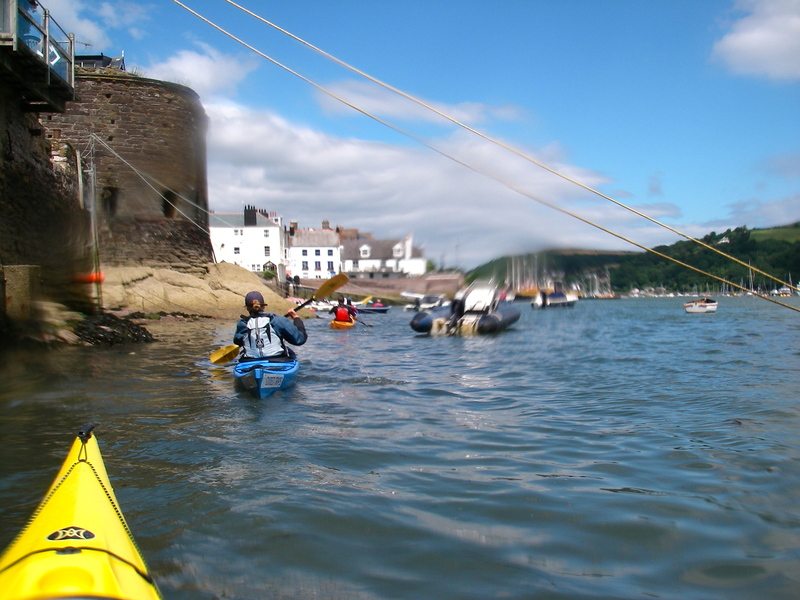 With the rivers being low in the summer we decided to do some sea kayaking just out of Dartmouth. 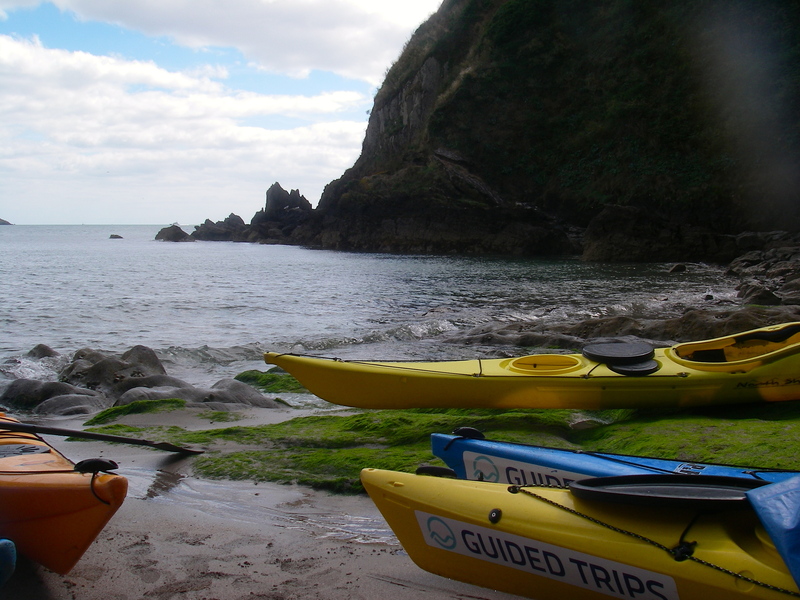 One of the reasons I love sea kayaking is that like caving or mountain climbing, it is one of the few ways you can truly escape from everyone and everything in todays modern world. I also have a strange fascination with sea caves and lighthouses which I blame on reading too many of Enid Blyton’s Famous Five books as a kid. It is a privilege to get close to the marine life who inhabit the coastline, such as seals, peregrine falcons, dolphins, and otters. 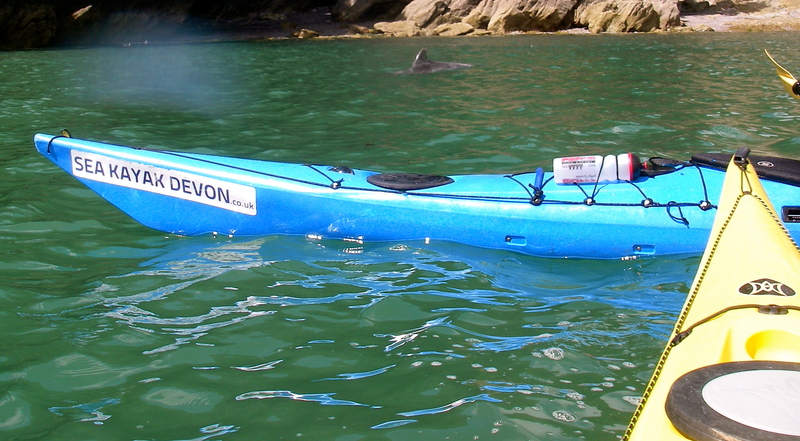 My favourite moment was seeing a dolphin less than a metre away from the bow of my kayak, while paddling back into Dartmouth harbour. (If you look very closely at the last photo on this post you might just see the dolphins finn. My boat is the blue one). 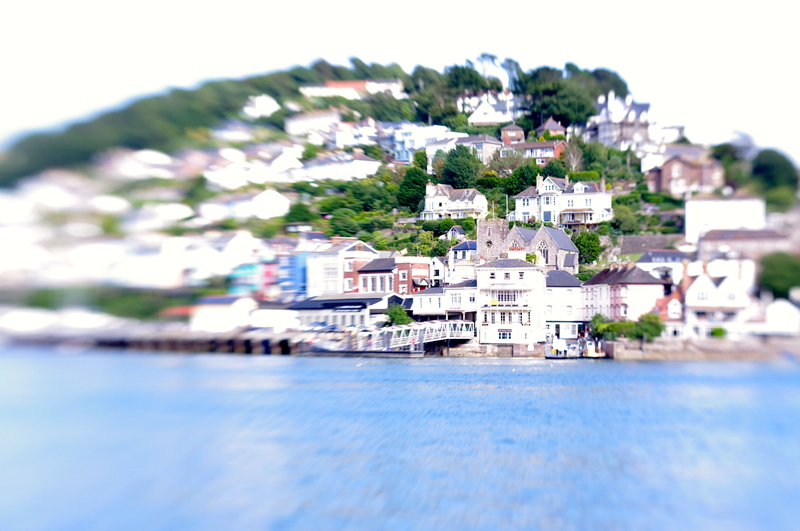 Another recommendation for Dartmouth would be Mitch Tonks RockFish Seafood, which won best UK fish and chip shop in the national fish and chip awards 2013. If you fancy something a bit different I would recommend the Fritto Misto, a mix of monkfish, gurnard, prawns, squid and whitebait, fried crisp the Italian way with no batter and just a little flour. 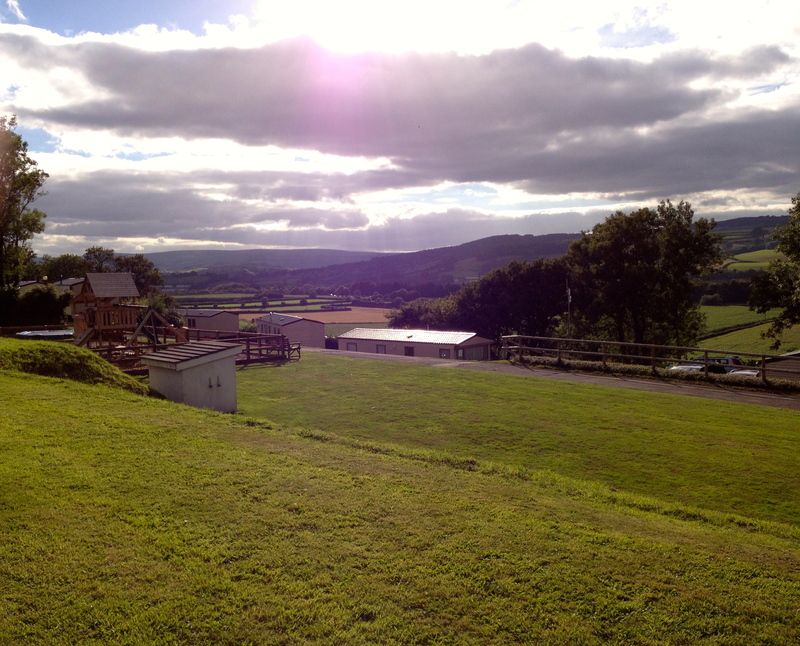 Devon has firmly established itself as having some of the best places to eat out in the UK, and lots of award-winning local producers such as Sharpham Wine and Cheese vineyard and dairy near Totnes. Along with fish, seafood, cheese, wine, pasties and clotted cream ice-cream, Devon wouldn’t be Devon without a cream tea. The exact origin of ‘cream tea’ is disputed, although there is evidence to suggest that the tradition of eating bread with cream and jam already existed at Tavistock Abbey in Devon in the 11th century. There are regional variations as to how a cream tea should preferably be eaten. 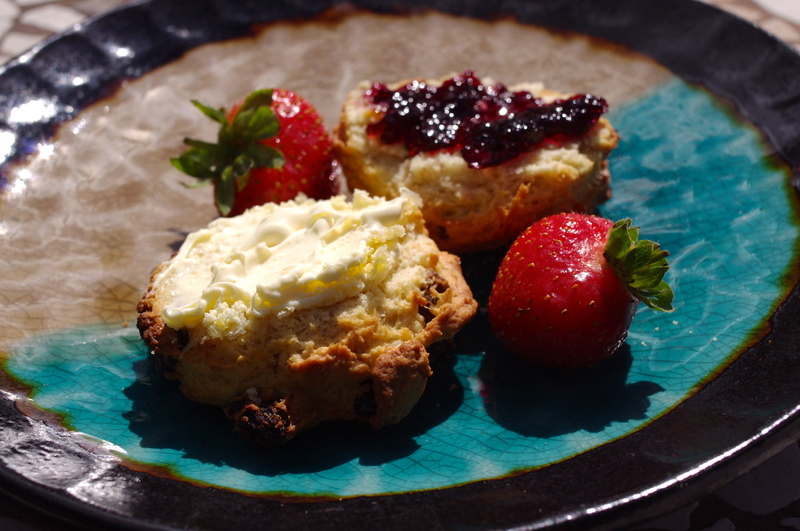 The Devon method is to split the scone in two, cover each half with clotted cream, and then add jam on top, or vice versa. 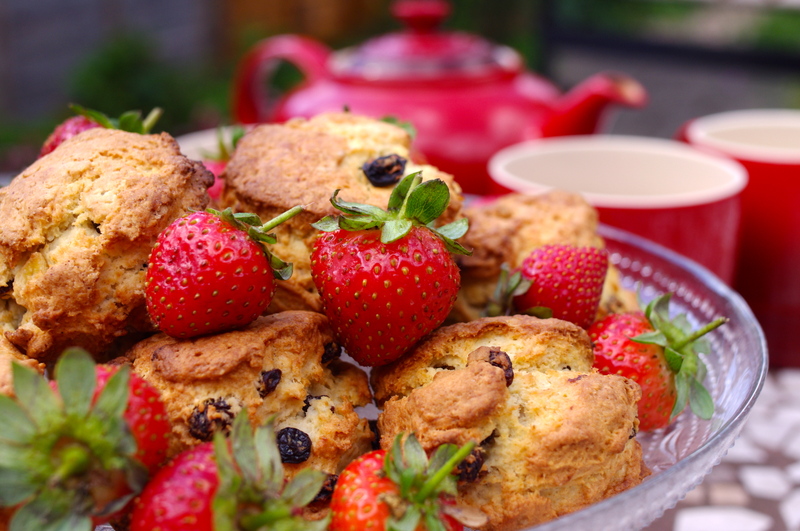 Traditionally it is important that the scones are served warm and that clotted cream rather than butter is used. 1) Preheat the oven to 220C, gas mark 7. 2) Sift the flour into a bowl then add the sugar and rub the butter into the dry ingredients until the mixture looks crumbly. 3) Sprinkle in the dried fruit, pour in the beaten egg and add 3 tbsp of milk. 4) Mix a dough with a knife, then bring the mixture together using your hands. The dough should be soft, but not a sticky dough, so add more milk a teaspoon at a time if it seems too dry. 5) Mould the dough into a ball with your hands. Turn out onto a lightly floured work surface. 6) Roll out very light to a thickness of about 3cm with a floured rolling-pin. The thickness is very important. The reason scones don’t rise enough is often because they are rolled too thin. 7) Take the pastry cutter and tap it sharply so that it goes straight through the dough. 8) When you have as many as you can cut out, knead the remaining dough together again and repeat. 9) Place the scones on the baking sheet, dust each one with flour and bake near the top of the oven for 12-15 minutes. 10) When they are done they will have risen and turned a golden brown. Remove them to a cooling tray and serve fresh. Split and spread with clotted cream and jam. Delicious! 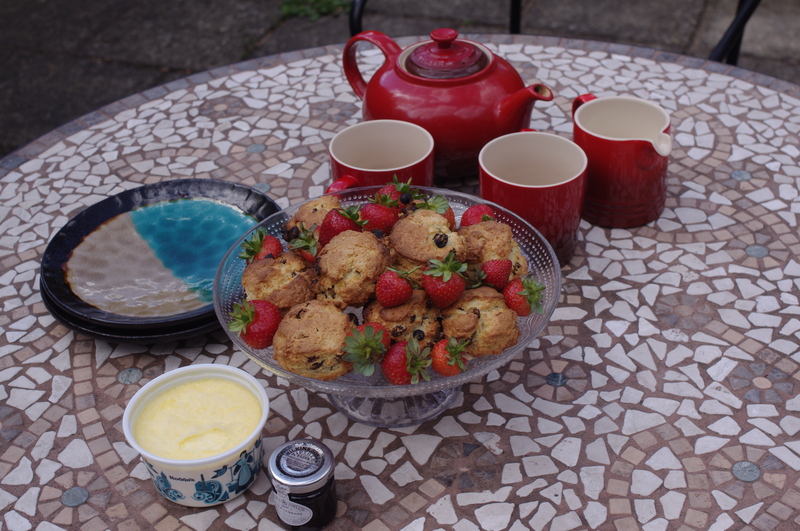 My contribution to International Scone week, another ingenious idea from Ceilia at Fig Jam and Lime Cordial and her friends Heidi and Joanna. Enjoy! Lovely! I have just sat down to write my post for International Scone week. Awesome. I look forward to reading your fabulous scone recipe. Emma. Thanks for visiting me Emma – fabulous Devonshire scones 🙂 strawberries and jam too! Thank you for your kind comments. Clotted cream is also a must if you are feeling very indulgent. Emma. Thanks Celia. I am glad you enjoyed the post. Take care. Emma. I am seeing scones everywhere I look 🙂 What a lovely situation to be in. Those look fantastic! I’m going to go make some scones this morning- thanks for the recipe! And thanks for visiting me- I’ve been so distracted and busy this summer my posts haven’t kept up with my life. I need to blog! Thanks Heidi. 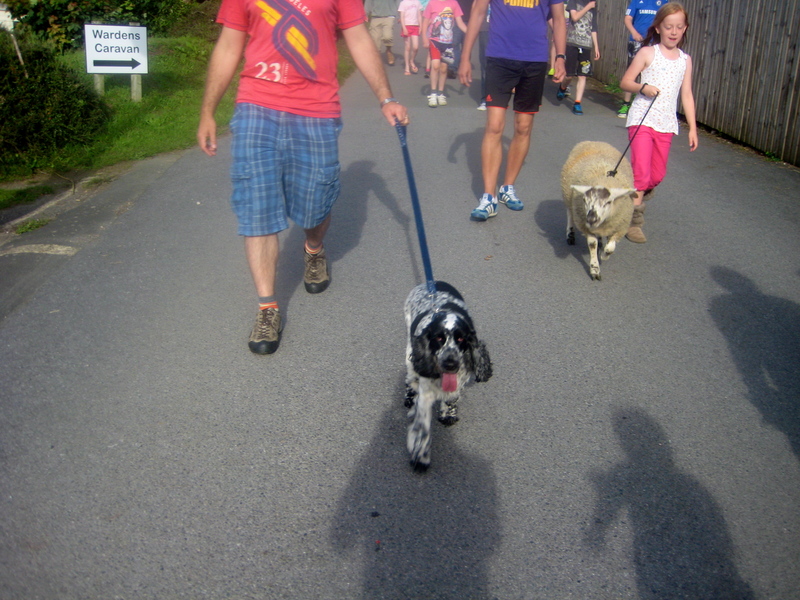 It is lovely to chat to you and I am glad you liked the scone post. Take care. Emma. I loved the Famous Five when I was a kid as well. 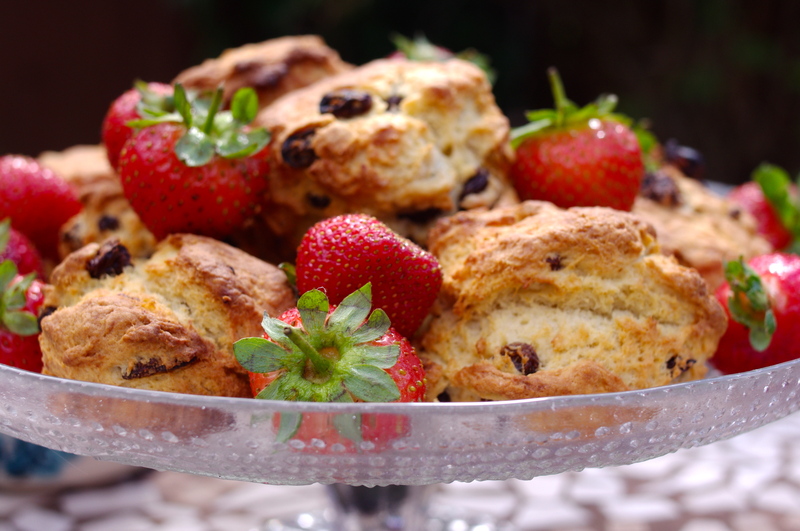 I used to ask my mother to pack picnics for me just like in the books and then sit in the garden on my own Famous Five adventure – those were the days… Scones look delicious, great photos! You can’t beat Enid Blyton, especially the famous five books. I used to love wet play at primary school just so I could go to the library and get a famous five book to sit and read. You might like my lavender and lemon shortbread recipe too. I think it is your kind of thing as we have very similar tastes. Take care. Emma. 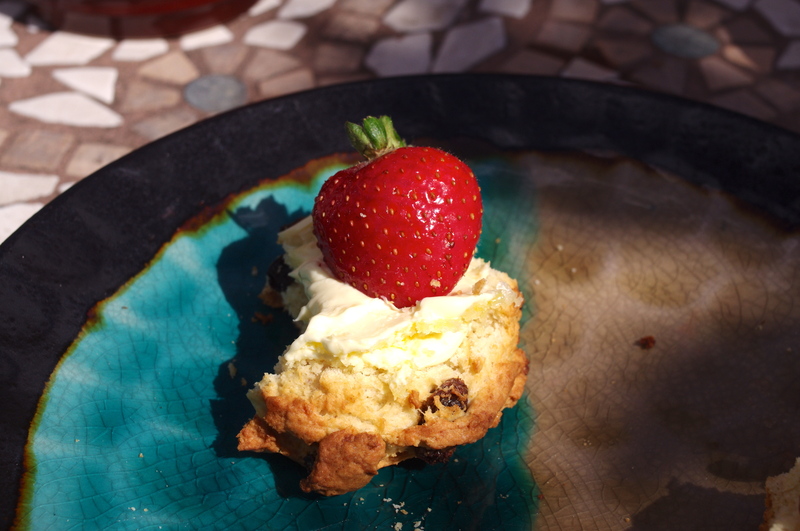 International scone week is something a few bloggers made up for a lark so i’m joining in with the fun.. It isn’t official. I am glad you enjoyed the post. Take care. Emma. Devonshire tea, in Devon, a bucket list entry i’ve been fortunate to tick off. The clotted cream is sublime, and if I was served scones like your recipe, I’d be very happy. Thank you. That’s so sweet of you. You are right about the clotted cream. Take care. Emma. Beautiful scones. Thanks for sharing those gorgeous sceneries. Thank you Norma. So kind of you to say so. Have a great week. Emma.